New York, NY, (CelebrityAccess) – The Madison Square Garden Company has sealed a broad-ranging deal with video streaming service Hulu that includes naming rights to The Theater at Madison Square Garden. 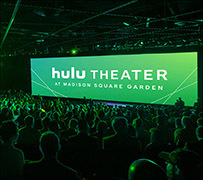 The theater will now be known as The Hulu Theater at Madison Square Garden, with Hulu branding and content fully integrated across the venue, as well as MSG’s digital and promotional platforms. In addition to securing naming rights to the venue, Hulu’s brand will be writ large across the venue, including new signage on Eighth Avenue, egress signage, and Penn Station directional and digital signage. as well as digital branding assets. The deal also includes plans for sweepstakes, promotional rights, digital branding assets, and ticket pre-sales to select events.